Cooking With Mickey: Ralph Brennan's Jazz Kitchen Celebrates Mardi Gras! Ralph Brennan's Jazz Kitchen Celebrates Mardi Gras! 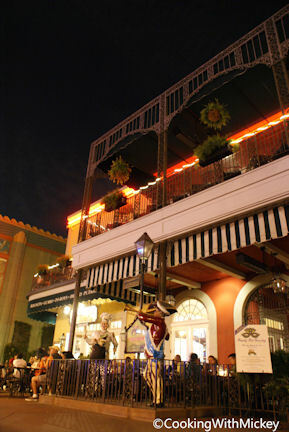 Tomorrow is Fat Tuesday and you can celebrate Mardi Gras outside of Bourbon Street in New Orleans. At Ralph Brennan's Jazz Kitchen in Downtown Disney at Disneyland enjoy special New Orleans entrees including some favorites like red beans & rice, gumbo, jambalaya and beignets. There will also be drinks specials like Abita draft beer for $3 and hurricanes for $5. Table-side magician trickes from 5:30 - 9:30 pm. Kenny Sara and the Sounds of New Orleans performing favorites in the Flambeaux Room from 7 - 10 pm. You can also enter to win "Become Jazz Kitchen Royalty for a Day!" contest. Just "Like" Ralph Brennan's Jazz Kitchen on Facebook. One King or Queen will be crowned on Fat Tuesday and receive VIP seating for you and your Royal Court, specialty beats and $100 to spend on Fat Tuesday at the restaurant.